Why Impact Resistant Windows + Doors from Lemon Bay Glass? • A Proven System: Our Hurricane impact doors and windows have been proven to safeguard buildings from destructive winds, shattering glass, wind born debris, torrential rain, and most importantly, objects capable of penetrating standard glass that could cause interior damage or loss of life. • There are No Alternatives: Unlike shutters and plywood, impact doors and windows provide continuous protection. No seasonal installation and removal is needed. The alternatives are flimsy and cumbersome, capable of being easily swept away by more belligerent wind. Hurricane impact doors and windows become an immovable part of your building’s structure. • Security: Laminated glass, used in Hurricane impact doors and windows, is tough, which will discourage thieves from intruding into your home. We have a client with surveillance video showing two would be thieves beating on a sliding door with brick pavers for 40 minutes without entry. Making your home safer as a result can result in reduced insurance rates, as many firms offer incentives for such measures. • Installation: No impact door or window is perfect without equally exceptional installation, and our installation team knows that. They have been trained exhaustively to complete each service with a white glove approach: correct the first time, and every time; meeting and exceeding both building code requirements and the satisfaction of our customers. Making a Decision on Impact-Resistant? Here are some basic steps to help make the right decision on impact-resistant windows + doors for your property. Whether for home or business, LBG will take the time to make sure it is the right fit for the property. exact product that you wish to have installed. Make sure the product in question meets the design pressure and does not exceed the size limitations for the product to be used. The wind-speed resistance is not relative to the code. The design pressure changes according to location and height of a building. It also depends on geographic location of the building. Being quoted a wind-speed is deceptive and not applicable. 2) Does product meet the current Florida building codes? If interested in a PVC product Make sure it is a uPVC (unplastisized PVC). a) uPVC is resistant to impact, expansion and contraction and works well in the Florida climate. b) Ask if the product has been tested to the Dade County protocol for accelerated aging. 3) Is the window/door frame reinforced? How? Is the product metal reinforced in the frame, meeting-rail and sash? Some products are just reinforced in the meeting rail and not throughout the whole window. 4) Are the corners fusion welded or mechanically fastened? Fusion welded corners will not loosen over time. 5) What are the mechanics of the window/door unit? What type of balances are used in operating windows? a) There are 3 types of balances 1: Spiral, 2:Constant Force (Coil) and 3:Block and Tackle. b) With weight of dual glazed laminated glass, being 8-10 pounds per square foot, it is necessary to make sure sashes operate efficiently. Block and tackle balances are the only balances rated both residentially and commercially. c) Spiral balances, unless commercially rated, cannot handle the weight and will frequently break. d) Constant force balances must be stacked and on larger windows you may need as many as 10 balances stacked per sash to operate the window. This limits ventilation or opening of that window and also there is more likelihood of a service issue. e) Block and Tackle balances use non corrosive parts with nylon parachute cord and have been tested to last 3-6 times longer than other balances. 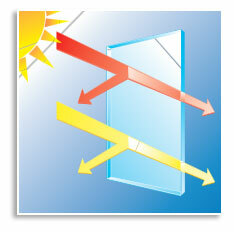 6) Is the glass energy efficient? If you are purchasing Low-E Glass Make sure it is a soft coat not a hard coat and ask to see the specifications of the glass. There many types of Low-E glass. The hard coat is the least expensive and least efficient. In Florida climate it does very little in the way of preventing heat gain. One of the most efficient Low-E is Solar Ban 60 by PPG. It is specifically designed to stop heat gain. Link here to read the full document from the glass association. Lemon Bay Glass + Mirror is your source for Impact Windows + Doors and more! Contact Lemon Bay Glass + Mirror today for information about our complete product lineup of impact windows and doors. Don’t forget to inquire about such beneficial attributes as: Low-E Glass, Turtle Glass, Reflective Glass, Tinted Glass, Thermal Insulated Glass Glazing, LEED options for energy efficiency.